AstroStack enables multiple images of the same object to be 'stacked', or combined into a single higher resolution image. It also provides a range of image enhancement facilities. 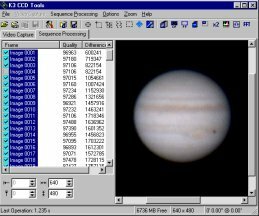 Astrostack is commercial software, but a free demonstration version is available. The GNU Image Manipulation Program is incontrovertibly the best freeware graphics software in existence. It is more powerful than commercial software such as Paint Shop Pro and can even hold its own against top of the range professional packages such as Adobe Photoshop. 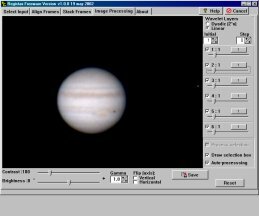 For astronomical purposes it is useful for changing colour properties, rescaling images and removing artefacts. K3 CCD Tools can be used to capture and process astronomy images from a variety of sources such as webcams and video cameras. An excellent frame selection tool is included which allows automatic or manual selection. The software aligns ands stacks the selected frames and offers a number of processing tools to optimise the final image. It is commercial software, but a free time-limited demo version is available. 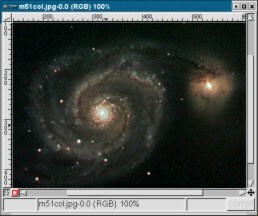 Registax is free software for alignment, stacking and processing of astronomy images captured with webcams and CCD's. The software uses wavelet processing techniques that are similar to a series of unsharp masks applied to an image to strip information from that image into layers. Cartes du Ciel is a sophisticated and versatile planetarium program. It can accept a large range of add-ons, available from its website. Although it could make a very strong case otherwise, Cartes du Ciel is free. Despite the French name, it provides full English language support. 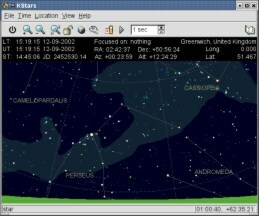 KStars is a freeware planetarium program designed for KDE (K Desktop Environment). It has an attractive and very easy to use interface. The view of the sky is detailed yet uncluttered. 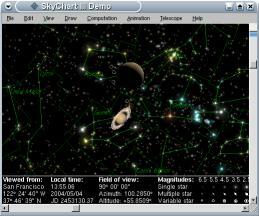 Sky Chart is a fascinating planetarium and space simulation program. With it, you can see the constellations as they appeared millennia ago, ride comets, or view the sky from other planets, moons and stars. Available for download is a time unlimited demonstration version in which save and export functions have been removed. XEphem is a powerful and sophisticated freeware planetarium program for serious users. As its creators explain, "it doesn't try to make the simple things easy, it tries to make the hard things possible". 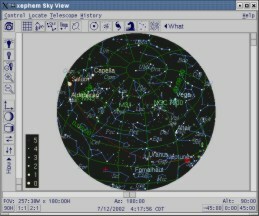 Primarily an observing tool, it comes with a large range of features to assist and plan observations. 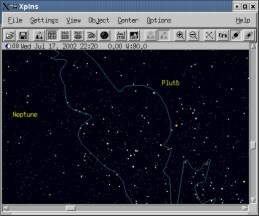 Xplns is a powerful freeware planetarium program. It is designed for serious users and comes with a large range of features. 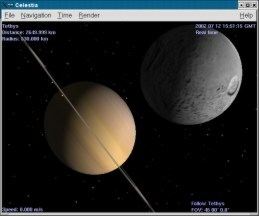 Celestia is a visually impressive program that lets you view the universe from almost anywhere. Whilst planetarium programs generally just show diagrams of planets and moons, Celestia shows beautifully rendered images complete with real surface detail. It is a bit like RedShift without the extras, but unlike RedShift, is free. Home planet is a free, general purpose astronomy program. Features include sky maps, satellite tracking, an orrery and the ability to view the earth from space. 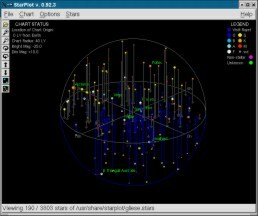 StarPlot is a free 3D starmap. Its main window consists of a spherical map that can be rotated about any chosen star. Its default map only holds a few stars, but this can be easily upgraded to every star within 100 light years of earth. MicroSky is a free planetarium program for J2ME enabled mobile phones. 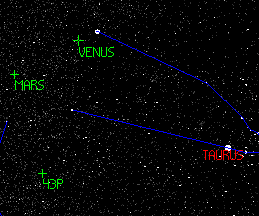 It doesn't contain its own star maps (and as result, is only 20KB in size). Instead, it downloads them as needed from the SkyServer computer, via the internet. Therefore, a phone with a "pay by the kilobyte" internet connection is essential. 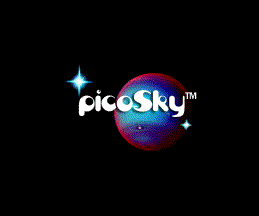 PicoSky is a commercial planetarium program for J2ME enabled mobile phones. Unlike MicroSky, it is self contained and so doesn't require a constant network connection. A free trial version (which is limited to 5 runs) is available for download.